An afro is a disco classic. When it comes to disco hairstyles, bigger is better! While the era of disco dancing may have died, the fabulous and larger than life styles straight from the dance floor will always hold a significant place in the history of hair trends. Famed disco dancing found its origins in African American and gay dance clubs in the late 1960s and 1970s. For quite some time, disco dominated these venues until it slowly cross-genred into the Latino community. Once Latinos picked up the style of the "four on the floor" beats, disco was soon accepted in the pop music community and became a universal music and dance trend. Not only did disco set the stage for a wide array of funk and psychedelic fashions, disco hairstyles were through the roof with funky afros, fabulous feathers, and groovy sideburns. Here's a peek at a few signature hair looks loved and worn in the disco era. 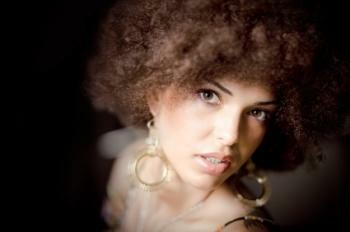 Disco hair was inspired by both African and Caucasian hair types. Many feverish styles were created by letting tight curls grow haphazardly, while others took hot rollers and a few cans of hair spray to ensure their longevity under the disco ball. Whether you're styling your hair for a costume event or just want to resurrect a few of disco's by-gone styles, here's a handful of dance-worthy inspirations. The afro was famous in the disco era. Women and men with natural tight curls opted for this carefree style as an expression of their culture and sense of freedom from society trends. While the afro obviously works best on African hair types, many others can wear this style provided their hair type is tightly curled and coarse in structure. When achieving an authentic afro, hair is left to grow out for several months without any shape or style mending. A daily comb through with a tight comb will help stretch the hair, directing it into a 90 degree shape. Daily conditioning is vital to prevent damage and breakage. The afro is a unisex style that can also be paired with thick sideburns for a very distinct seventies hairstyle. Farrah Fawcett found her way into many men's hearts working her famous loose and feathered waves. If you want to capture her golden girl disco hairstyle, you'll need to add some layers to your cut and style with hot rollers, directing the hair back from the face. Once rollers are removed, finger comb to the back and spray with plenty of aerosol hairspray. The best cut for feathers is a 70s shag hairstyle that lets the hair flow loose and free. Feathered hair was yet another unisex look worn by plenty of men, including John Travolta and The BeeGees. If you want to create yet another classic disco hairstyle, you may consider channeling the infamous Marcia Brady from the Brady Bunch. Marcia wore her hair straight as a pin and parted it straight down the center. The key to achieving this classic 1970's style is in keeping the hair healthy as it grows to a substantial length. If you highlight or color your locks, you may want to revert back to your natural shade to ensure that the health of your hair improves throughout the growing out process. Deep conditioning treatments and regular hair trims will also help maintain your hair's health and shine. Disco was all about making a statement, and disco hairstyles followed suit fearlessly. The look of this bygone dance era is distinguished by a multitude of hair textures, lengths and styles. Today, many of the same hair styles have found their way back into the stylist's chair; a modern shag is now styled with a straightening iron rather than rollers to achieve a polished look, a straight and parted style is paired with a bang for added edginess, while the afro, no matter the decade, stands alone as one of the most expressive and artistic shapes worn in the disco hairstyle era. If you want a unique and signature style, why not channel your inner dancing queen and opt for any of these pure funk hair inspirations?